David Cameron's return to Number 10 might have been celebrated amongst Conservatives, but for most of the other political parties there was disappointment, consternation and a need to re-evaluate their future strategy. There has also been anger on the streets and growing calls for electoral reform. Given the failures of the Labour Party, UKIP and particularly the Liberal Democrats, the day after polling was marked with resignations as their respective leaders announced their intention to stand down. UKIP's leader expressed not only his disappointment that the party only secured a single seat in parliament also but anger. Farage declared the UK political system "bankrupt" given that his party obtained nearly 4 million votes but only one seat. He then went on to announce his resignation as leader but added that he wasn't "giving up on UKIP". Only hours before Nick Clegg had also announced his intention to stand down as leader of the Liberal Democrats which had a disastrous night, losing some 50 seats across the UK. Clegg said he accepted "full responsibility" for the party's poor performance but said he "expected this election to be difficult for the Liberal Democrats" [BBC / Sky News / Telegraph]. The Tory win has raised concerns that austerity will increase, services will be cut and that Thatcherite authoritarianism will return. Thus it was perhaps no surprise that fringe far left wing groups flocked to central London on Saturday [9th May] to vent their anger. Various groups appeared to be behind the protests. The pseudo-anarchist group Class War sent out a tweet on Saturday morning calling for people to gather outside Tory HQ. There also calls for protests by other fringe groups through Facebook. Some one thousand people marched from the Conservative Party headquarters along Whitehall to Downing Street where some protesters battled with police. At least 17 arrests were made and there were a handful of injuries reported amongst the ranks of police that were deployed to contain the situation. Hundreds of anti-government protesters, some holding placards reading "I pledge to resist" and "Stop the cuts". Some placards were a little more colourful. Chief Supt Gerry Campbell said the "vast majority" of protesters had taken part peacefully, but added that a "small minority" had been intent on causing disorder [BBC / Sky News / Metro / Daily Mail]. Amongst the more peaceful protesters was the celebrity singer Charlotte Church who was spotted holding a placard reading "I'm mad as hell and I'm not going to take it any more" [Daily Mail]. 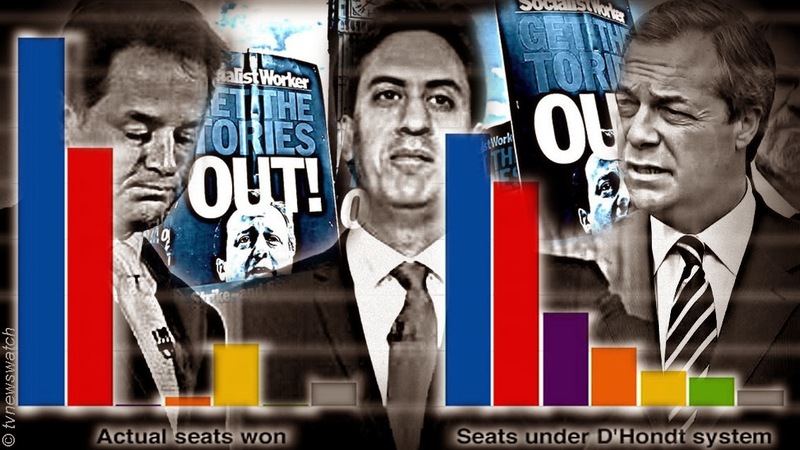 The election result has highlighted the imbalance that exists in terms of how the electorate are represented, especially given Britain has entered an era of multi-party politics. Even before polling day there had been some discussion concerning proportional representation [ITV News]. The full results indicated that many parties would have done a great deal better under some form of PR. Particularly poignant were the publication of maps showing second place results [Telegraph / Metro]. The maps are certainly interesting but what would parliament have looked like with proportional representation? It all depends on the type of PR employed, but should the UK adopt the D'hondt system that is used for selecting MEPs the Conservatives would still have won, but there would have been a significantly more members of parliament representing the likes of UKIP, the Green Party and Liberal Democrats. As can be seen from the list above, proportional representation would have been good for UKIP and the Greens which under the present system have but a single voice each. Many of Northern Ireland's parties would however lose out as would single person independent candidates. For example despite having been an MP since 2001 the independent candidate Sylvia Hermon would have lost her seat if PR were to be implemented. There has been much commentary on why the Liberal Democrats lost so badly. Where did all those supporters go, and why did they abandon Nick Clegg and the party of the centre right. Some have suggested there was a shift because of the Lib Dem's failure to deliver on some of its promises or simply due to anger that the party had got into bed with the Conservative party and formed a coalition. Failing on promises may be an issue, however a weaker part of a coalition obviously has less clout that the dominant force. In fact the Lib Dems actually helped deliver several of its 2010 pledges [Guardian]. Many of the party's high-profile pledges, such as scrapping tuition fees and opposing nuclear power, have been ditched but perhaps more have been adopted than might have been expected for the smaller party in a coalition. The party had called for the first £10,000 people earn to be tax-free, something that was delivered under the coalition. A pledge to increase funding for the most disadvantaged pupils by £2.5 billion was also met as was a call for the introduction for compulsory language and competence tests for doctors working in UK. Of course there were many things the party failed to deliver, but for a party in coalition the Liberal Democrats did far better that they might have done, and infinitely better than if they had not joined forces with the Conservative party. By becoming a part of a coalition the Lib Dems also helped reign in the more extreme right wing tendencies of the Tory right. Indeed there were some core Tory policies that the Lib Dems prevented the Conservative from implementing [i]. Now the Lib Dems have been all but wiped out there is already talk of reviving policies such as the so-called 'snoopers charter' that was scuppered by the coalition [Guardian]. Nonetheless there are still many core Lib Dem supporters who feel that they were betrayed by their party. There may another reason why there was a large drop in Lib Dem support. With the rise in UKIP, and the risk of a Labour SNP coalition, many Lib Dem voters may have felt compelled to vote for the Conservatives. To have done otherwise would have resulted in an almost certain Labour win and a far greater number of seats falling to the United Kingdom Independence Party. UKIP support had certainly swelled and its core support probably took votes away from the Conservative party. But there is anecdotal evidence to suggest that it gained supporters from the more extreme right. The British National Party for example saw a massive drop from 2010 when it took 563,743 votes. Five years on the party only achieved a paltry 1,667 votes across the entire country. The question is where did those half a million votes go? With such extremes in politics, there will be many that might reject proportional representation for fear of allowing far right groups achieving their voice in parliament. Some also argue that PR leads to weak government run by committee since there would rarely be an overall majority. The counterargument might be that by attaining majority rule, the first past the post system establishes a form of dictatorship under a guise of democracy - given of course that every member of the ruling party is whipped into line. But given the imbalance of power and lack of representation for much of the electorate that the first past the post system offers, the argument for PR is certainly going to grow. A poll conducted for the i newspaper just days before the election indicated that 61% of the electorate believe the voting system should be changed to better represent smaller parties in parliament. Getting the system to change may prove difficult since any party that wins in the future would not see any advantage in changing the system which benefited in its success and introduce another that might reduce its future chances. What if there were no BBC?